OmniGraffle Pro 7.8 – Create diagrams, flow charts, and more. Orthogonal Line Routing - OmniGraffle 7.8 brings significant improvements to OmniGraffle’s line routing algorithms. Any document that is opened with OmniGraffle 7.8 will automatically be updated to use the new orthogonal line routing behavior. 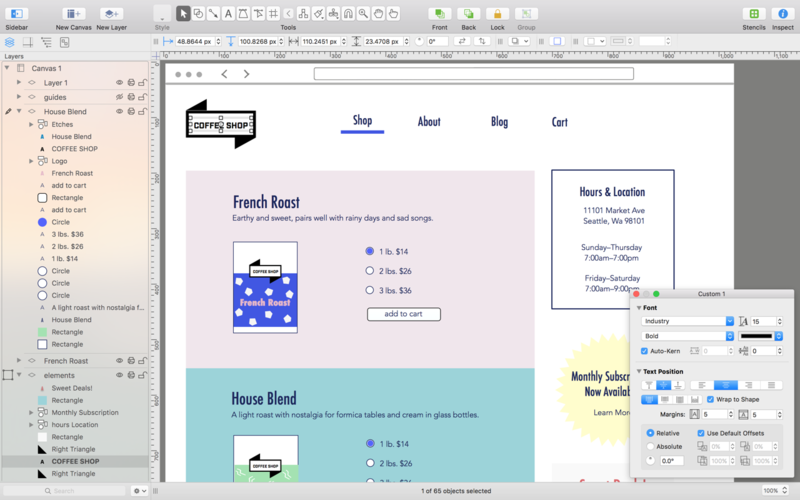 Diagram Layout - The new "Connected Objects" option in the Diagram Layout and Style inspector makes it easier to enable auto layout without accidentally moving content that isn’t connected by lines in your diagram (like a header, footer, or logo). Diagram Styles - Diagram Style options have moved from the Format menu to the Diagram Layout and Style inspector. You can choose between styling All Objects or Connected Objects and there is an option to continuously enforce the diagram style. Hold down the option key and the buttons only apply to the selected objects. Auto Layout - Automatic Layout operations are now animated to make it easier to see where your content is shifting to. Auto layout has also been updated to improve performance and produce more reliable results. Line Connections - There is a now visual distinction between lines connected to an object and lines connected to a specific magnet on an object. If a line is not connected to a specific magnet then the line’s selection highlight will continue past the line ending to the center of shape and through any magnets that are influencing the line’s path. Outline Sidebar - The Outline sidebar now converts pasted lists into individual objects based on line breaks making it easier to get outline content into OmniGraffle. Line Magnets - Circular line magnet indicators have been replaced with color coded diamonds that indicate what type of point on the line the new line will connect to. A blue diamond indicates a connection to a midpoint, a red diamond is a connection to the tail of the line, a green diamond is a connection to the head of the line, and a connection to any other point on the line will be indicated by a pink diamond. Lines - "Remove Midpoints" (in the Edit→Objects menu) has been renamed to "Remove Midpoints and Reset Handles" and will now reset orthogonal line handles in addition to removing line midpoints. Sidebar - The left sidebar can be made much wider to accommodate long titles and deep hierarchies. Diagram Styles - When using diagram styles, customizations to a object’s style are now preserved when moving that object to a new position in the hierarchy. Mouseless Editing - Fixed a few cases where selection would be lost while using the outline tab of the sidebar to build a diagram. These improvements make it much easier to build your diagram from just the keyboard. Also, pressing Command-Return will now toggle label editing on and off. Orthogonal Lines - There is now a specific icon (a crosshair) to indicate when an orthogonal line has been pinned to a path as opposed to using automatic routing. Magnets - Magnets now appear as you are approaching a shape while drawing or moving a line to make it easier to target those magnets. Magnets also grow in size to indicate when a line is connecting directly to the magnet instead of the shape. Scripting - Object ID Numbers are now changed less frequently, making them a more reliable tool for scripting. Text Entry - Fixed a bug that caused auto-correct to end text editing of a label before the user was done typing. Presentation Mode - Fixed a bug where canvases would be blank in presentation mode when presentation mode was started on a canvas other than the first canvas. Artboard Export - Fixed a bug that caused a black background when exporting an artboard with transparency disabled. Next story UltData for Android 5.1.0.0 – A savior complete data for any file type. Previous story Path Finder 8.0.4 – Powerful, award-winning Finder alternative. Sketch 3.1.1 – Vector drawing application.